There are only 10 days until Christmas! Christmas is my favorite time of the year. It is a time of such joy in my family. Family get togethers, watching the children experience the fun of Christmas. And, this year, I have a new grandson which was the inspiration of for the shirt. Masterworks III has a great text tool. I used 10 fonts and 11 colors for the lettering. Then, I used the heart in custom shapes to add the small hearts in the design. I embroidered the design on my Janome 9900 so I my only limitation was the size of the hoop 6.7″ x 7.9″. It is the perfect size of the front of a turtleneck shirt. I varied lettering, adding some all uppercase and all lower case in addition to the traditional first letter upper, remaining lower. You can create text embroidery designs from many embroidery software programs, such as Designers Gallery Embroidery Works, Floiani FTC/U, Viking 5d Embroidery, 6D Embroidery, Palette, PE Design, and many more. 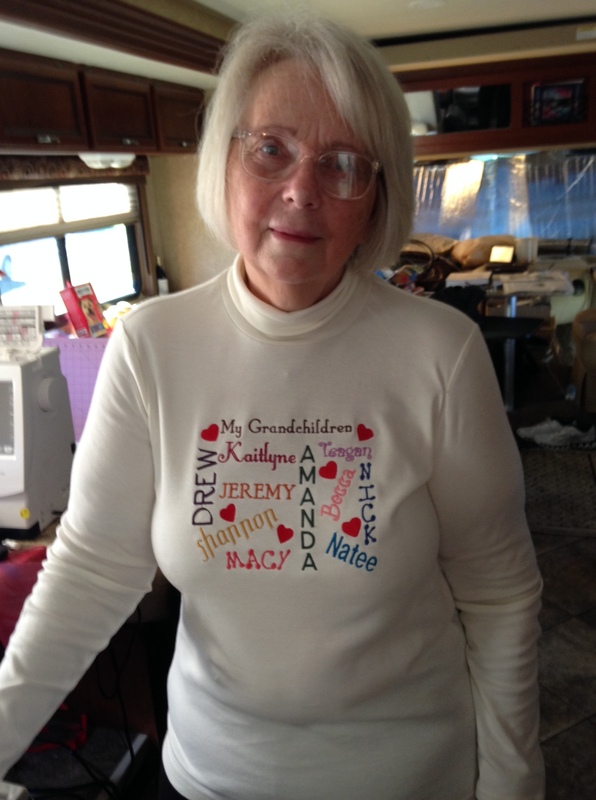 Don’t just use this idea for the names of your children or grandchildren. I also create a holiday shirt for the holidays. 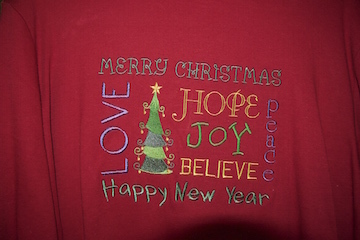 I added one of the Christmas embroidery designs from my collection to the text. Are you inspired? If so, open that embroidery software see what you can create! This entry was posted in Embroidery Projects, Embroidery Softare and tagged embroidery, embroidery software, lettering tutorial, masterworks III on December 15, 2014 by Designs by Marje.